Hello, my name is Lucy and I’m an addict. The crispy bacon, buttery toast, perfectly poached eggs and creamy hollandaise are a combination that I just can’t nail in my own kitchen. 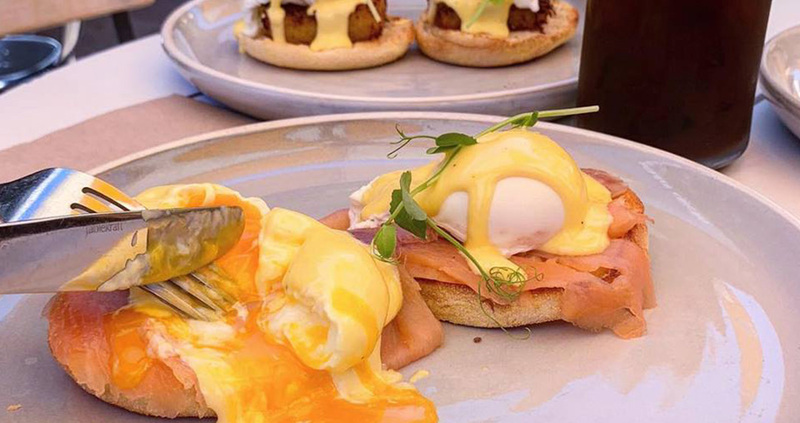 Lucky for me, Canberra brunch spots have the goods and I’ve sussed out some of the best benedicts in town. Kith and Nosh – With a strong focus on mindful eating and seasonal produce, let the chefs at Kith and Nosh whip you up whopping eggs benny. This isn’t your average benedict either –accompanied by baked mushrooms, sautéed spinach and cherry tomatoes to give your breaky a wholesome kick, the choice of bacon, ham or salmon to atop your generously buttered sourdough is a meal you won’t be forgetting. The welcoming staff and central location make this a spot you can’t miss when doing mainies of Lonsdale street looking for a hot brunch spot. Doubleshot – In the quaint yet bustling shops at Deakin, you won’t miss Doubleshot’s sprawling courtyard setting and the content crowds enjoying their coffees in the sun. The use of Australian produce puts their benedict near the front of the pack. Free range eggs and fresh hollandaise are served with a choice of Pialligo bacon, Tassie smoked salmon, baby spinach, hand carved ham or potato rosti. The best bit is that you can go back and have it five times, all different. Teddy Picker’s – At the rapidly expanding hub in Campbell, Teddy Picker’s has held their own as an attractive brunch spot for locals, office workers, families and friends every day of the week. It’s the perfect spot to continue the indulgence of the holiday season with their glazed Christmas ham, deliciously smoky hollandaise and soft poached eggs on a classic English muffin. The benedict has been an iconic staple on the menu since it’s humble beginnings and continue to reign as a crowd favourite. The Knox Made in Watson – With a huge focus on the local community, the cosy courtyard nestled in Watson draws customers from all over Canberra to try amazing coffee, satisfying food and lots of doggo pats. It is the perfect spot for families and there’s plenty to keep the kids busy as you enjoy your benedict. Keeping to the basics of toasted English muffins, poached eggs, signature silky hollandaise and wilted spinach – you have the choice of smoked salmon, braised ham hock, grilled bacon or sautéed gourmet mushrooms (for the vegetarians). Ricardo’s – Admittedly where my addiction to benedict’s began, I couldn’t leave Ricardo’s in Jamison off the list. Once you get a table and finally pull your eyes away from the most amazing cake cabinet you’ve ever seen, order yourself an eggs benedict with a very welcome twist. Their benedict features pulled pork, poached eggs and harissa hollandaise, served on a soft focaccia. Suggested additions of Spanish Chorizo Sausage, Avocado or a Hash Brown are hard to pass up as you treat yourself to this mega meal.